Benchmarking – Standard, or a set of standards, used as a point of reference for evaluating performance or level of quality. Benchmarks may be drawn from a firm’s own experience, from the experience of other firms in the industry, or from legal requirements such as environmental regulations. Business process reengineering – The business process reengineering method (BPR) is defined by as “the fundamental reconsideration and radical redesign of organization processes, in order to achieve drastic improvement of current performance in cost, service and speed”. Value creation for the customer is the leading factor of BPR and information technology often plays an important enabling role. Continuous quality improvement – CQI is an approach to quality management that builds upon traditional quality assurance methods by emphasizing the organization and systems. It focuses on the “process” rather than the individual, recognizes both internal and external “customers” and promotes the need for objective data to analyze and improve processes. The rapid growth and proliferation of managed care organizations in the healthcare industry has caused many public health agencies, providers, employers, and consumers to question the quality of healthcare and the consequences for patient safety. Cost of quality– Sum of costs incurred in maintaining acceptable quality levels plus the cost of failure to maintain that level (cost of poor quality). Customer satisfaction – Degree of satisfaction provided by the goods or services of a firm as measured by the number of repeat customers. Employee involvement – Regular participation of employees in (1) deciding how their work is done, (2) making suggestions for improvement, (3) goal setting, (4) planning, and (5) monitoring of their performance. Encouragement to employee involvement is based on the thinking that people involved in a process know it best, and on the observation that involved employees are more motivated to improve their performance. Globalization – Globalization in its literal sense is the process of transformation of local or regional phenomena into global ones. It can be described as a process by which the people of the world are unified into a single society and function together. This process is a combination of economic, technological, sociocultural and political forces. Just-in-time (JIT) – Pull‘ (demand) driven inventory system in which materials, parts, sub-assemblies, and support items are delivered just when needed and neither sooner nor later. Its objective is to eliminate product inventories from the supply chain. As much a managerial philosophy as an inventory system, JIT encompasses all activities required to make a final product—from design engineering onwards to the last manufacturing operation. JIT systems are fundamental to time based competition and rely on waste reduction, process simplification, setup time and batch size reduction, parallel (instead of sequential) processing, and shop floor layout redesign. Under JIT management, shipments are made within rigidly enforced ‘time windows’ and all items must be within the specifications with very little or no inspection. Kaizen – Kaizen means “continuous improvement”. It is a Japanese philosophy that focuses on continuous improvement throughout all aspects of life. When applied to the workplace, Kaizen activities continually improve all functions of a business; from manufacturing to management and from the CEO to the assembly line workers. By improving standardized activities and processes, Kaizen aims to eliminate waste. Kaizen was first implemented in several Japanese businesses during the country’s recovery after World War II, including Toyota, and has since spread to businesses throughout the world. Management philosophy – a philosophy and style of management that gives everyone in an organization responsibility for delivering quality to the customer. Total quality management views each task in the organization as a process that is in a customer/supplier relationship with the next process. The objective at each stage is to define and meet the customer’s requirements in order to maximize the satisfaction of the final consumer at the lowest possible cost. Total quality management constitutes a challenge to organizations that have to manage the conflict between cost-cutting and the commitment of employees to continuous improvement. Achievement of quality can be assessed by quality awards and quality standards. 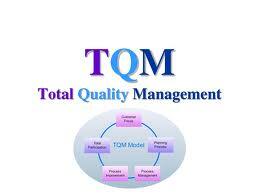 Monitoring process variation – It’s an important element of TQM. It is a series of actions that leads to a particular result, occurs when there is a deviation from standards, which invariably affects reliability and quality of products or services. Paradigm shift – Fundamental change in an individual’s or a society’s view of how things work in the world. For example, the shift from earth to sun as the center of solar system, ‘humors’ to microbes as causes of disease, heart to brain as the seat of thinking and feeling. Participative management – An open form of management where employees have a strong decision-making role. Participative management is developed by managers who actively seek a strong cooperative relationship with their employees. The advantages of participative management include increased productivity, improved quality, and reduced costs. PDCA cycle – Four-step process used in quality control and elsewhere as a simplified method of achieving improvements. These steps are: (1) Plan: determine what needs to be done, when, how, and by whom. (2) Do: carry out the plan, on a small-scale first. (3) Check: analyze the results of carrying out the plan. (4) Act: take appropriate steps to close the gap between planned and actual results. Named after its proposer, the US mathematician Dr. Walter Shewart (1891-1967). Also called Deming cycle or plan do check act (PDCA) cycle. Preventive maintenance – Systematic inspection, detection, correction, and prevention of incipient failures, before they become actual or major failures. Contrasted with corrective maintenance. Quality – “Quality itself has been defined as fundamentally relational: ‘Quality is the ongoing process of building and sustaining relationships by assessing, anticipating, and fulfilling stated and implied needs.’ Organizational performance ultimately rests on human behavior and improving performance requires changing behavior. Therefore organizational restructuring should have as a fundamental goal the facilitation of clear, open communication that can enable organizational learning and clarify accountability for results. To ensure that everyone works on those activities which are most important for the success of the business by fulfilling work group missions. To improve the quality of work delivered to the internal customers. To eliminate work that is wasted. To harness the combined skills, ideas and experience of the work group members to improve the business continuously through teamwork. To satisfy the external customer. Quality guru – They are the quality leaders who have immensely contributed towards the development of total quality management as a management philosophy and a way of corporate life. Such as Walter Shewhart, Edwards Deming, Joseph Juran, Philip Crosby etc. Reward and recognition – Effective use of Reward and Recognition (R&R) is a proven, practical and cost effective means of motivating people and improving business performance. A programme that is well thought through, structured, communicated and embedded, can give a business a competitive edge when it comes to attracting high performers into the organization and retaining the loyalty of valued existing employees. At a different and altogether more significant level, R&R is a fundamental component in the ongoing, and of late, much debated process of employee engagement. We define Reward as the tangible return beyond basic salary that is given to an employee for delivering results; and Recognition as the way or the context in which the employee receives both tangible and non-tangible returns. A Reward and Recognition programme is the structured framework within which this process takes place. It typically involves a currency in which employees can receive credits, an environment in which these credits can be exchanged for goods and services and a set of rules and best practice advice, under which the programme should operate. Team-building – The term ‘team building’ can refer generally to the selection and motivation of teams, or more specifically to group self-assessment in the theory and practice of organizational development. When a team in an organizational development context embarks upon a process of self-assessment in order to gauge its own effectiveness and thereby improve performance, it can be argued that it is engaging in team building, although this may be considered a narrow definition. The process of team building includes, (a) clarifying the goal, and building ownership across the team and (b)identifying the inhibitors to teamwork and removing or overcoming them, or if they cannot be removed, mitigating their negative effect on the team. Top-down implementation – The top-down approach to implementing an identity management solution focuses on implementing identity management capabilities for an individual managed resource, such as an application. In the top-down approach, your organization strives to realize higher-level capabilities for a more narrowly focused group of users, such as those who are closely associated with the managed application. Total Quality Management (TQM) – Total Quality Management (TQM) refers to management methods used to enhance quality and productivity in organizations, particularly businesses. TQM is a comprehensive system approach that works horizontally across an organization, involving all departments and employees and extending backward and forward to include both suppliers and clients/customers. Total quality tools – Beginning from the design phase through production of a product a few statistical tools need to be employed. These are total quality tools. Tools are important and they need to be used for facilitating human rational thinking in solving problems that occur in the work process. Transformational leadership – Motivational management method whereby employees are encouraged to achieve greater performance through inspirational leadership, which develops employee self-confidence and higher achievement goals. Zero defect – The concept of zero defects was coined by Philip Crosby who viewed that the ultimate goal of a TQM system should be reduction of variation in the production of products and services to absolute zero.